This site is dedicated to everything about Paint By Number. If you are a fan of the wonderful paint by number kits or vintage paintings, you will love all the Paint By Number online stores and shopping options. You can search the Paint By Number categories on the lower right-hand side of any page. Be sure to visit our Paint By Number Stores page for all the recommended stores that carry Paint by Number. We make it EASY for you to shop for ALL YOUR FAVORITE PAINT BY NUMBER ITEMS – and ALL IN ONE EASY-TO-SHOP PLACE! You will be proud to display your paintings on your walls! 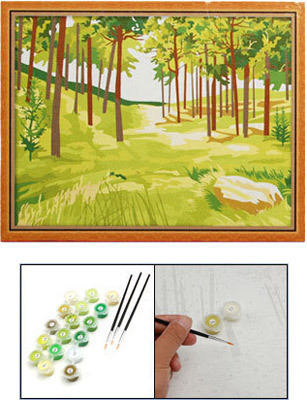 Diamond Painting is an easy, fun and relaxing new craft hobby. Everyone can enjoy Diamond Painting whether you are young or old, beginner or lover. Although the craft is called Diamond Painting, it is not actually painting nor has anything to do with diamond. It is more like cross stitch, paint-by-numbers and mosaic all combined in one. So if you are familiar with either one, it is easy to figure out how to get started. It is a simple process: pick up the faceted diamond-like rhinestone and place it according to numbers indicated in the pattern, then keep repeating the process until the design is completed. The design vary form simple and easy to elaborate and complicate. You can choose the design according to your skill and liking. I love this wonderful ocean/beachy idea from Sarah Stewart of LifeOnVirginiaStreet.com, which appeared in the 9/5/16 issue of Woman’s World. All you need are a canvas, a brush, and a few paints! Purchase a Paint-By-Number set. Pick one that you really like to increase the chances that you’ll finish it. Sets come in many different varieties of subject matter: birds, flowers, seaside scenes, woodland scenes, cartoon characters, automotive themes. Get a cup of water with which to clean your brush. Use a cup you don’t usually drink from or one that can be washed thoroughly. A paper cup is fine. Disposable food containers also work well, for example, a used yogurt container. Also, stock the area with some rags. Paint the smallest areas that are marked with arrows first, just so you don’t accidentally cover them up. Make sure you cover all the areas and don’t leave white spaces between blocks of color. One of the worst mistakes an artist can make is leaving white spaces. Paint doesn’t stick to cardboard canvases as well as it does to normal ones. Try to get the better, but sometimes more expensive, ones for their good canvases. Don’t try and sell a paint by number off as your own creation. It is dishonest and in many places it can be against the law. In 1952, Macy’s agreed to stock paint-by-numbers kits, and just a few months later, an amateur painter won third place at a San Francisco art competition with one. The press coverage noted that most people couldn’t tell the difference between the kit versions and the original paintings. Eventually, Craft Master kits were such a hit that paint-by-number works by J. Edgar Hoover and Nelson Rockefeller were hung in the West Wing of the White House. Kitsch is back, and nowhere is this more apparent than with the recent craze for vintage paint-by-number paintings. Dating back to the 1950s and `60s, these works, once reviled by the art world, are now considered icons of post-war American pop culture and are valued collectibles. Made for the most part by anonymous amateurs–average suburban wives or Sunday hobbyists–paint-by-number kits such as Craft Master promised that anyone could “be a Rembrandt.” In doing so, they helped bridge the gap between the elitist and John Doe as millions of Americans picked up paintbrushes for the first time. Subjects ranged from picturesque landscapes, cowboys and kittens to still-lifes, ballerinas and old Master knockoffs such as da Vinci’s “Last Supper.” And believe it or not, the art world is starting to take these “objects d’art” seriously, as collectors scramble to find undiscovered pieces and an increasing number of galleries hold shows. Paint-by-number, or PBN, was the brainchild of artist/designer Dan Robbins with the support of Max S. Klein, owner of the Palmer Paint Co., in 1951. Although earlier examples of PBN existed during the 1920s, these were marketed to children. Inspired by a story about Leonardo da Vinci assigning numbered portions of paintings to his assistants to complete, Robbins believed such a paint system could appeal to adults. The timing was certainly perfect: Following World War II, Americans experienced an age of prosperity and an abundance of leisure time. Millions moved to the suburbs, and signs of conformity were everywhere–from the mass-produced homes in housing developments to the shiny red Fords parked on the curbs. Why not standardize art as well? The numbered canvases, colour-coded to tiny pots of paint, guaranteed satisfaction. The craze peaked from 1953 to ’55, but like all fads it began to fade by 1957 due to overexposure, according to Robbins, who is the author of Whatever Happened to Paint-by-Numbers?. Finished paintings soon ended up in basements, attics, trash cans and thrift stores, where they sold for as little as a nickel. “Americana has been in for quite a while, and this is iconic … You’d be hard-pressed to find someone who doesn’t have some connection to the medium,” he added. Robbins feels part of the trend is due to the fascination of retro art by today’s 20- and 30-somethings. “I think the renewed interest in PBNs has come a lot from a younger generation who has decided that paint-by-numbers are suddenly kitschy, a piece of Americana,” he said.